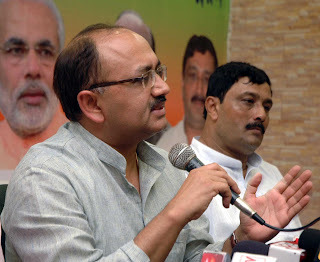 Our Correspondent ● Kolkata: Bharatiya Janata Party (BJP) will hold a rally on 11 October from College Square to Esplanade to protest the violence carried out by West Bengal chief minister Mamata Banerjee, during the recent civic polls in the state, informed BJP national secretary Siddharth Nath Singh in the city today. The slogan of the rally will be ‘Mamata Bhagao, Bangla Bachao’ (evict Mamata, save Bengal). The rally will be led by Singh himself and BJP state president Rahul Sinha. Speaking to newspersons, Singh said that on 3 October, democracy was raped under the garb of Bidhannagar civic polls and today it was killed. “Everything was done because Banerjee is paranoid of being ousted from power.” The Bengal chief minister, he alleged, is very sceptic as she knows that the people of her state are aware of the nonsense which she is carrying out. “She is actually continuing the legacy of what the Left Front government did in its long 34 years of misrule, disrupting the peace and harmony of the state,” he added. The BJP national secretary said that senior Trinamool Congress (TMC) leaders like Sujit Bose, Paresh Pal, and Arjun Singh were seen flexing their muscles outside their constituencies on election day, where they had no business. They cordoned off the polling area and prevented voters from entering the booths, Singh alleged, adding that these leaders also roughed up journalists. “It proves that Banerjee is sheltering goons and is destroying the land of Swami Vivekananda,” said the BJP national secretary. The BJP will approach the Election Commission in Delhi and will highlight the violence unleashed by TMC in the civic polls. Singh feared that the violence in the local government elections is a prelude to what is likely to happen during the assembly polls next year.